JD(S) is contesting in eight seats, Tumkur being one of them, and Congress in 20 seats in the state. While JD(S) chief and former prime minister H D Deve Gowda filed his nominations from Tumkur on Saturday, the sitting MP, Congress’ S P Muddahaumegowda also went ahead and filed his nomination from the same seat, claiming that he was the official candidate from there. Notably, as per as the seat-sharing deal in Karnataka, JD(S) is contesting in eight seats and Congress in 20 seats in the state. Of them, JD(S) got Tumkur from where it chose to field Deve Gowda. Now he is faced with a strong rival who is actually an ally. This could also jeopardise the alliance the two parties have in the state. Karnataka Deputy Chief Minister and Congress’ state unit chief G Parameshwara has also urged Muddahanumegowda to “obey the coalition dharma”. “I request him (SP Muddahanumegowda) to obey the coalition dharma. We have to follow high command’s order that gave eight seats to JD(S). If HD Deve Gowda changes his mind, please give this seat to us,” Parameshwara told media here. The friction between JD(S) and the Congress has, in no way, lessened. The two parties fought last year’s Assembly elections against each other but came together only to keep the BJP, which emerged as the single largest party, out. However, the rank and file of both the parties weren’t quite happy with the decision of an alliance. 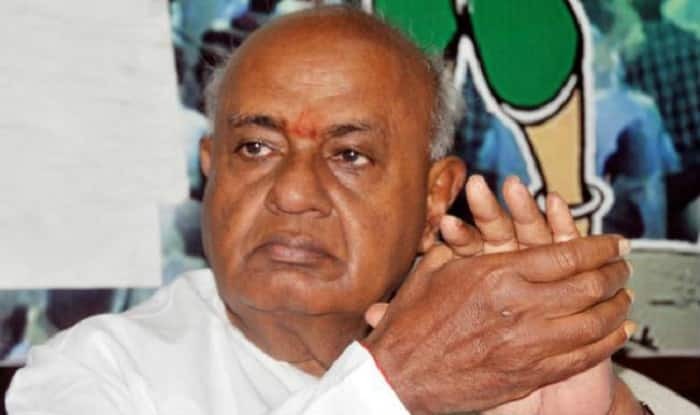 Senior Congress leader K N Rajanna told ANI that they were requesting Deve Gowda to contest from Bengaluru North instead or fight from Tumkur on a Congress ticket. Reports say that Bengaluru North is one seat which JD(S) was reportedly planning to return to the Congress as it hadn’t found a candidate for the same. Deve Gowda is the sitting MP from Hassan but his grandson Prajwal Revanna will be contesting from that seat this time. In a telling comment, Chief Minister H D Kumaraswamy said on Sunday that a few Congress leaders were creating hurdles for JD(S) candidates. “Few people in Congress tried to create speed breakers for my candidates. I won’t let Janata Dal (Secular) workers do the same. The country is important for me. No matter how much they backstab my candidates, JD(S) workers and I won’t do the same for 20 seats allocated to Congress in alliance with us,” Kumaraswamy told media persons at Mandya.